Angel Capital Season 5th Starts on Mar. 31st! 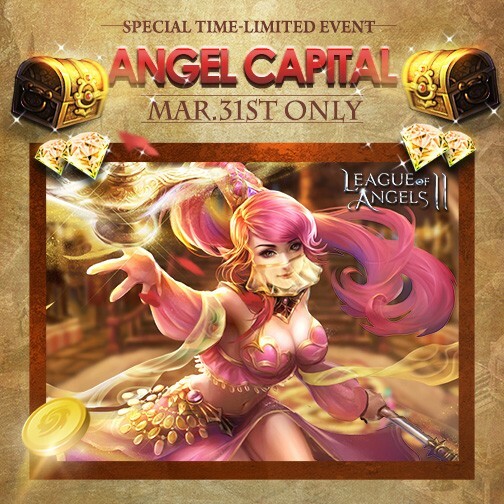 New round of “Angel Capital” will be held on Mar. 31st! Players can buy Raffle Tickets for a chance to winning huge prizes equal to 50 times of the raffle ticket value! We’ll draw 10 lucky winners for the grand prize and 1 special prize! On Apr. 6th, we will post a raffle drawing video so you can watch as we draw the 11 lucky winners! Purchase Raffle Tickets on Mar. 31st! On Mar. 31st, all players can buy Raffle tickets with Topaz . 1. Raffle Tickets can be bought in Events in the game. 2. A Raffle Ticket will cost 2,000 Topazes. All players can directly purchase 15 Tickets a day at most with Topazes. 3. Raffle Tickets are win you chances to get the final grand rewards, but also can be used to exchange for great value resources in Ticket Bonus Event. 4. If you buy two tickets, you’ll have two cards with your name put into the raffle drawing. The amount of name cards equal to the amount of Raffle tickets you buy. The more Raffle tickets you buy, the greater your chances of winning! Your Raffle Tickets Can Be Exchanged for Many Items! Ticket Bonus event enables all players who purchased Tickets to exchange their tickets for various resources and items at a great value. This means even if you were not one of the 11 lucky winners, your tickets can still be exchanged for rewards many times their value! 1. From Mar. 31st to Apr. 6th, the Ticket Bonus event can be found in Events. You can exchange your Tickets during the event time, and if you didn't use up all the tickets this time, it can be reserved for next Angels Capital event. Please note the reserved ticket cannot be counted in raffle drawing in next round of Angel Capital event! 2. There will be various kinds of resources and items at great discount and you can choose the ones you prefer. What kind of savings can you get? Check it out in-game on Mar. 31st. Who will be our Lucky Winners!? Watch the Lottery Drawing on Apr. 6th! On Apr.6th, we’ll post the raffle drawing video on Facebook, YouTube, and also inform everyone in game as well. There will be a raffle box with the IGN & Server of all participants. The amount of names equal to the amount of Raffle tickets you have. The more Raffle tickets you buy, the greater your chances of winning! Special Prize, 1 participant, any one Suit (outfit+wings) or one Mount he or she wants.